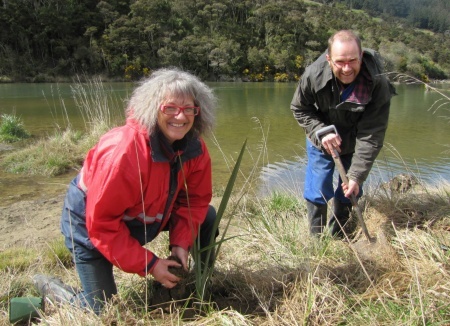 Living Legends planted close to 10,000 native trees at the Orokonui Scenic Reserve which is adjacent to the township of Waitati, on the shore of Blueskin Bay. The area is enjoyed by the local Waitati community and forms the lower part of the Orokonui catchment. This estuary fringe was largely in rough pasture prior to the Living Legends project, with the exception of one area of well established native species. Living Legends, in partnership with DOC, the local community and Rugby Legend Kees Meeuws, have successfully established thousands of native plants in this heavily grassed and very wet site. While some ongoing management will be required, it is hoped much of the grassland will be returned to native vegetation. Living Legends will continue to oversee the maintenance of this planting project in conjunction with the Department of Conservation, who will care for it for years to come. Orokonui Scenic Reserve is a 28 hectare tidal estuary and an important area for whitebait and wading birds. The site lies within the rohe of Ngāi Tahu Kāti Huirapa Rūnaka ki Puketeraki. It is envisaged that the Living Legends project will transform the low-lying rank pasture into a thriving natural wetland, resembling what it might have looked like, and sounded like, over 150 years ago. 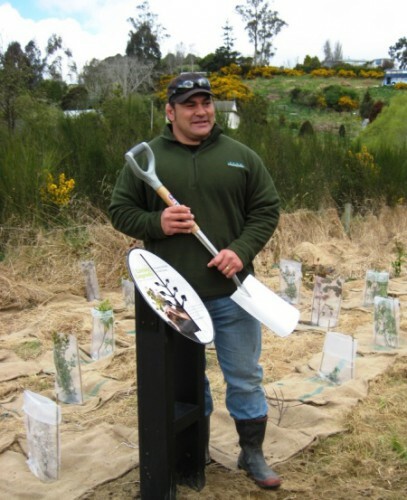 With the establishment and growth of native plantings, the restored habitat of Orokonui Scenic Reserve will ultimately link Orokonui Ecosanctuary, which is 307 hectares of 100 year old regenerating forest with Blueskin Bay, creating an intact ‘mountains to sea’ altitudinal sequence of indigenous vegetation, and will provide important foraging habitat for the birds of Orokonui. Kees Meeuws was selected as the Otago Rugby Legend, honoring his 28-year rugby career, which is not over yet. Kees returned to Otago in 2009 to reclaim his starting position as a prop for the Otago team, and is the Scrum Coach for The Highlanders. Rugby has been a lifelong passion for Kees, his earliest memories are of playing in bare feet, with fog and mud squishing between toes. At that early age, Kees wasn’t to know that his greatest dream would come true – to pull on the All Black jersey years later. He gives advice to young rugby players now to “Get active, give every positive thing in life a go. You will never know if you’ll like it if you never give it a try. Experiences create character” he says. Of Maori and Dutch descent Kees was educated at Kelston Boys High where he made the 1st XV in his Year 10 year. He went on to represent New Zealand Under 17 in 1991, under 19 in 1993 and the New Zealand Colts in 1994-95. He also made three appearances for Auckland in the 1994-95 seasons. A move to Otago saw him appearing in a formidable 1997 Highlanders and Otago front row alongside New Zealand Under 19 team mates Carl Hoeft and Anton Oliver. After a strong season in 1998 he was called into the All Blacks for the final Tri-Nations test, his first All Blacks test. With such diverse interests as diving, hunting and art (he was a student at the Elam School of Fine Arts intending to major in sculpture) he was a distinctive and valued team member, often highlighted on television for his strong ending to the All Black haka. In 2002 Kees returned to Auckland, appearing in every Super 12 match for the Blues and each NPC match for Auckland. As an All Black he scored his first test try against Italy that year and followed with two against Fiji and one each against France and Wales. He scored a further four test tries in 2003 and hi 9th try against Tonga at the Rugby World Cup in Australia made him the world’s leading try scoring prop. He pushed the record to 10 in a match against the Pacific Islands in 2004. When he left New Zealand for a contract in France at the end of the 2004 season Kees had 45 All Black appearances (42 tests), 80 Super 12 matches, 40 matches for Otago and 19 for Auckland to his credit. The totals would have been greater had it not been for a number of leg injuries.